Every moment, six million cubic feet of water drop from a height of some 177 feet onto a dense composite of giant boulders in what is one of the most mesmerizing wonders Mother Nature bestowed on our planet. Niagara Falls, right on the border of Canada and the United States, is the collective name of three waterfalls transforming Lake Erie into Lake Ontario, creating a breath-taking scene year round. They are Horseshoe Falls, the American Falls, and Bridal Veil Falls. 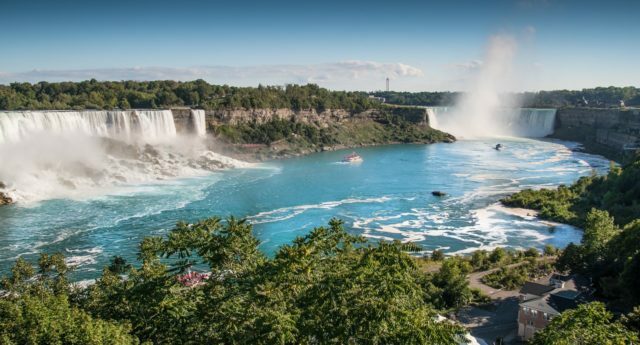 Niagara Falls is definitely on the bucket list place for many people around the globe, tourist accommodations exist on both sides of the border along with boat rides by day and fireworks by night. But then there are those who want to go over the falls. From then on up until this day, most who have tried to match the feats of Sam and Annie died in the attempt. An estimated 5,000 people have died going over Niagara Falls; sadly, this number includes suicides. Among the small number of people who intended it as a daredevil feat and succeeded was Bobby Leach. 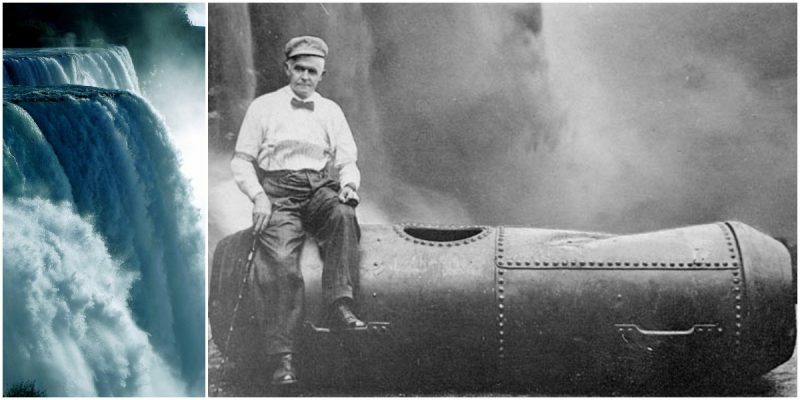 A stuntman and a circus performer, he survived going over the falls in a barrel, only to die in a bizarre fashion 15 years later. It was July 25, 1911, and at the time no-one had succeeded in following in Annie’s footsteps. Leach made the drop in his specially designed steel barrel and spent six months in the hospital afterward, recovering from the injuries he sustained. The fall left him with two broken knee caps and a fractured jaw but he had his title of first man to survive a barrel drop. Born 1858 in Cornwall, Bobby was an established stuntman performing for years with the Barnum and Bailey Circus. 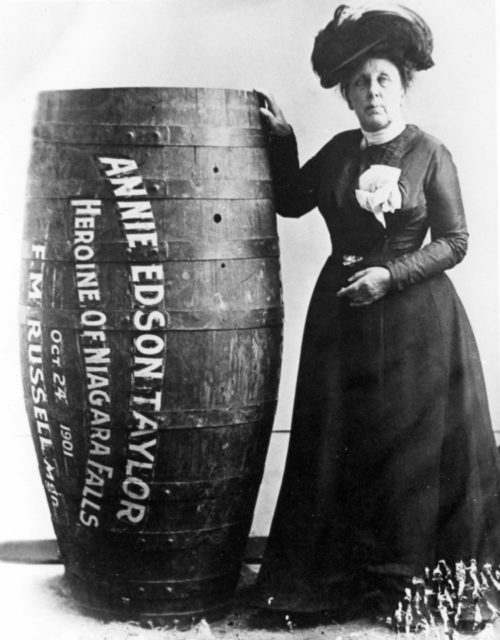 Before his trip over the falls, he operated a restaurant on Bridge Street in which he would brag to his customers that anything Annie could do, he could do better. So after a while, he began constructing a tube that would fit him in and could hit a faster speed than an ordinary barrel. 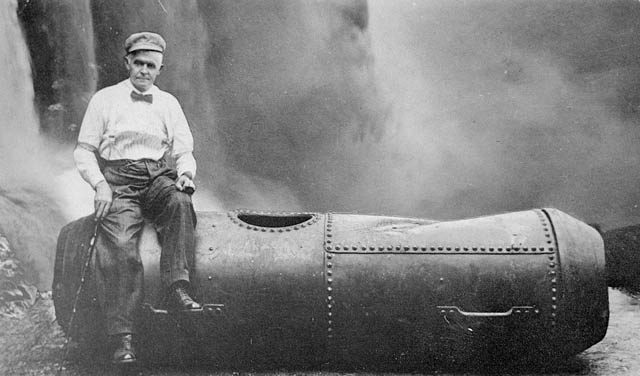 Finally, he came up with an elongated steel barrel for his brave (stupid) feat of going over the Niagara Falls. Yes, he might have been broken and shattered for almost half a year, but the stunt brought him fame and many folks wanted to see him and hear about his experience in person. As a result, he toured Canada, the United States, and England for several years, describing his frightening journey, exhibiting his barrel, and posing for pictures at various shows and lecture halls. 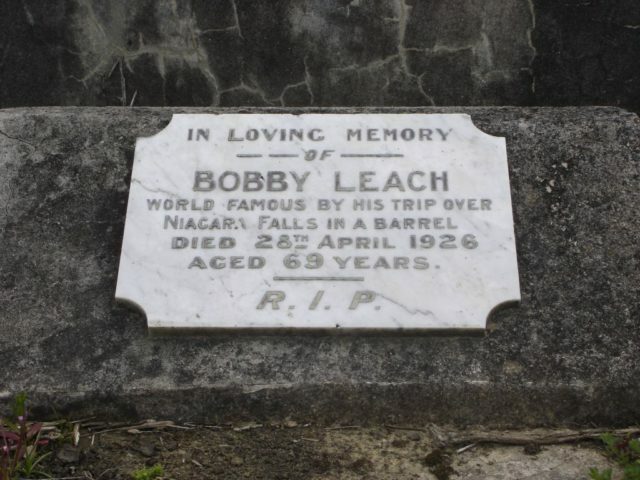 Bobby Leach returned to Niagara Falls when he was in his sixties, with the intention of swimming the whirlpool rapids. Unfortunately, he failed all attempts, and his last might could have killed him, if it weren’t for the Canadian daredevil and rescuer, William “Red” Hill, Sr., who saved him. It was in 1926 during a publicity tour of New Zealand that Leach, after of one of his lectures, slipped on an orange peel on a pavement close to his flat in Princes Street and broke his leg. The leg injuries he suffered during his falls attempts might have weakened the limb that now was broken. Complications set in and Leach’s injured leg became infected. It developed into gangrene and had to be amputated. After the procedure, his health deteriorated and shortly afterward he died. Today it’s illegal in both the United States and Canada to go over Niagara Falls.